This Halloween Ale Festival opens on Thursday 30th October at 7pm and closes on Sunday 2nd November. 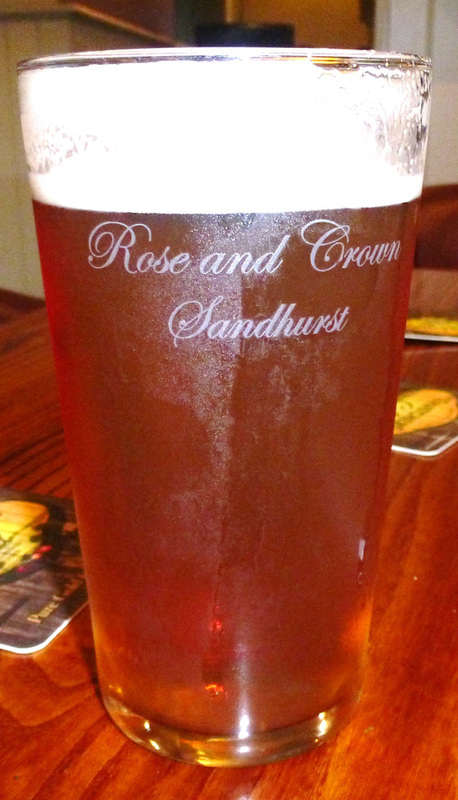 The Rose & Crown was one of the pubs we visited when we launched Ascot Ales’s ” Monsters in The Dark ” on 3rd July. There will be four Co-ALE-ition ales on sale at this Ale Festival all of them are highly appropriate and relevant for Halloween, details are as follows:- 1. Monster Mash (4% golden ale) which will be accompanied by the Boris Pickett Monster Mash record (see attached video link). 2. Monsters In The Dark (5% Exile Stout) 3. HowlinGale (3.9% dark old ale). 4, Our new Co-ALE-ition 4.5% Dark Porter will be officially launched at this Ale Festival. Howling has been invited to open this Ale Festival on Thursday 30th October, the photos are going to be amazing as everybody dresses up and paints their faces etc. 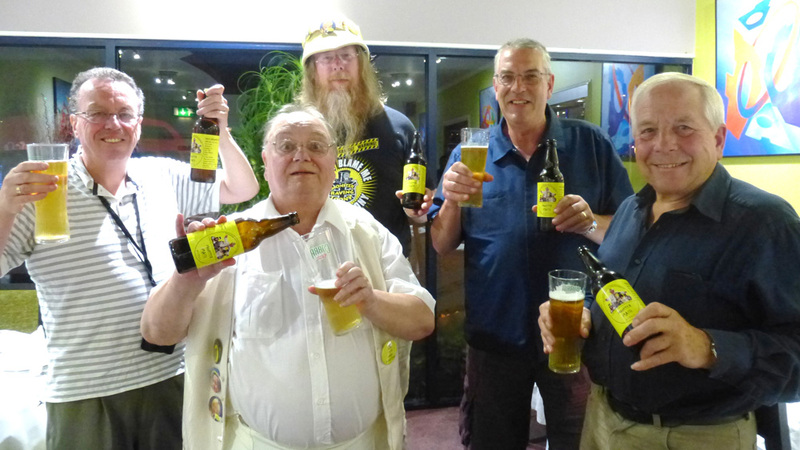 Howling found time in his very busy schedule at the Annual Conference last week in Llandrindod Wells to host the Radnorshire CAMRA’s website launch event at the Ridgebourne Inn on Sunday. Howling, a fully paid up member of CAMRA himself, introduced the Radnorshire CAMRA committee members to Monster Mash in a bottle. The celebrations began on the 18th Sept with a special lunch event to celebrate the 1st year anniversary of Co-ALE-ition i.e. celebrating Longdog’s Winning Co-ALE-ition being officially launched at the Prince Arthur in Fleet on 18th Sept 2013 at an event attended by over 300 people, including many local dignatories such as Sir Gerald Howarth and local Mayors and many councillors. Who would have predicted just a year later that 8 very different Co-ALE-ition ales would have been successfully launched involving 7 micro breweries who between them have now sold more than 25,000 pints of Co-ALE-ition at over 160 different venues. The Top 5 Co-ALE-ition events over the last 12 months were agreed as follows: 1. Longdog’s Winning Co-ALE-ition on sale in The Strangers Bar at the Houses of Parliament, 2. The Monster Mash launch event featuring Howling and all 5 members of the OMRLP cabinet, 3. The Fleet Lions Ale Festival (when all 6 Co-ALE-ition ales were available at the same time and all of them sold out on the day), 4. Ascot Ales’ Monsters In The Dark launch event in three different counties on one night and finally 5. Wild Weather’s HowlinGale launch event in pubs across Oxfordshire which included David Cameron’s local constituency pub the New Inn at Witney. 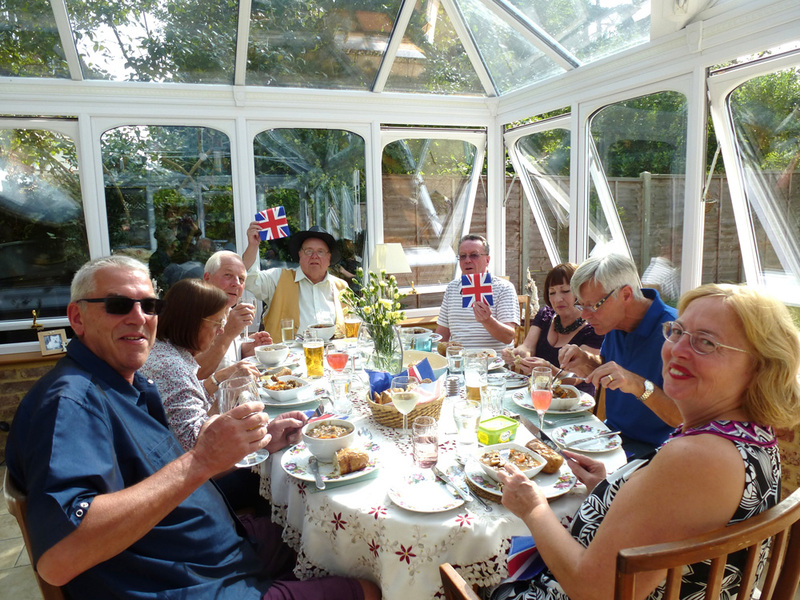 Sue Carr, hosted this special lunch and had prepared a home made menu for the invited guests. The starter was a fish course – Salmond and Sturgeon on toast recognising the Scottish Independence vote taking place on that very same day followed by Steak and Monster Mash Ale Hotpot served with baked potatoes and crusty bread and finally Cheriton Orchard Apple Crumble and custard. Monster Mash in a bottle was the selected Co-ALE-ition ale for this lunch event and it was poured in perfect condition. Presentations were made by Howling to local Fleet residents and fantastic Loony Party supporters – Leon Slater and Steve & Joy Lawson for their dedicated support and commitment to Co-ALE-ition over the past year. The Party then moved on at 6pm to the Prince Arthur in Fleet for an event hosted and arranged by Howling. There were four different Co-ALE-ition ales on sale on the night — Longdog’s Winning Co-ALE-ition, Ascot Ales’ Hope & Glory Single Hop IPA. Langham’s Co-ALE-ition Gold and Ascot Ales’ Monsters In The Dark. It was great to see people there who had made significant contributions to the outstanding success of Co-ALE-ition in its 1st year including Dan Proctor (Manager of the Prince Arthur) who came along even though it was his birthday and Phil Robins owner and head brewer of Longdog brewery in Basingstoke whose Winning Co-ALE-ition ale was the start of this great adventure. Howling and Kevin Travers (CAMRA) presented Dan Proctor with two special certificates which recognised the Prince Arthur becoming the first pub to sell 100 casks (7000 pints) of Co-ALE-ition ale in less than 12 months and for also becoming the first Wetherspoons pub to sell 5 different Co-ALE-ition ales. Dan Proctor was also given a warm round of applause by everybody there for getting into the CAMRA Good Beer Guide for two years running (2014 & 2015). 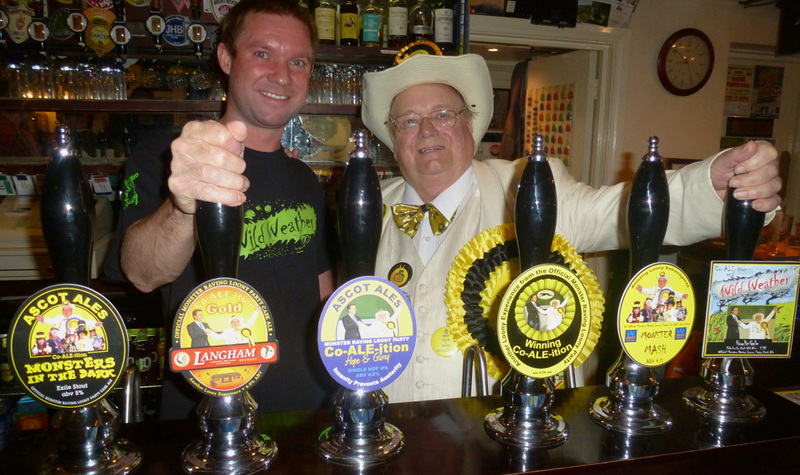 The 2015 CAMRA Good Beer Guide, which only came out last week, not only mentions Co-ALE-ition but also the Official Monster Raving Loony Party, which was another thirst for the Party. At 10pm the Party moved on to the Hook Tandoori which has become the Co-ALE-ition favourite Indian restaurant and for the 1st ever time a Co-ALE-ition ale was available to drink there with an Indian curry. The ale we selected was Monster Mash in a bottle which was perfectly poured and in great condition and really complemented the Indian spices. The food and service in the Hook Tandoori, as always, was exceptional and Monster Mash proved to be very popular on the night. Other diners were looking over enviously as we drank Monster Mash at £1.67 a bottle and they drank their bottles of Cobra and Bangla at £5.45 each. The Hook Tandoori owner and his staff were also very impressed and asked us to leave them some bottles of Monster Mash so they could sample this ale themselves, their feedback since then has been very positive, unfortunately this special limited edition of 1000 bottles of Monster Mash has competely sold out and no further production is planned. 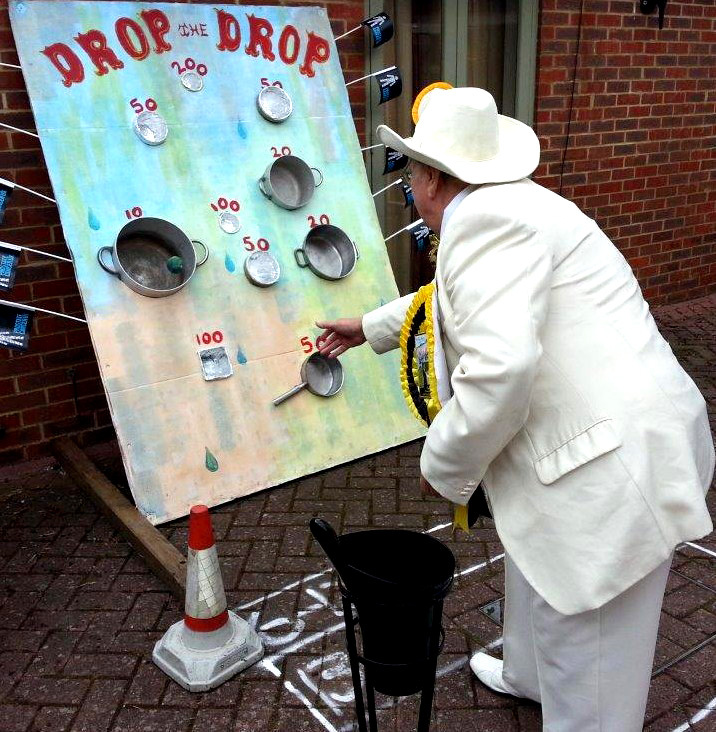 Howling was on great form throughout the day, he was the life and soul of the Party, reeling over his one liners and anecdotes. He delivered a passionate Union speech with no scipt where he confidently forecast a NO decision in the night’s other big occasion, the Scottish Independence vote. 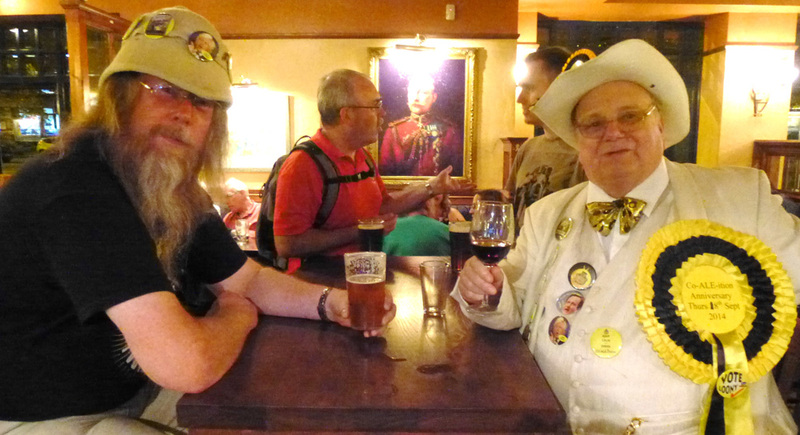 He went on to say that the Oxford Mad Hatter was in Edinburgh that night along with Co-ALE-ition friend and supporter Colin Bex (Leader of the Wessex Regionalist Party). Howling also confirmed it was the Official Monster Raving Loony Party who first came up with the three recommended options for the Scotland Independence Vote ballot paper i.e. In, Out, Shake it all About (aka more devolved powers for Scotland). Howling went on to highlight the many Co-ALE-ition achievements over the last 12 months and confirmed there were many more Co-ALE-ition developments in the pipeline in the run up to the 2015 General Election. Howling confirmed he was standing for the OMRLP at the Clacton on Sea by-election next month and would also be putting himself up against Boris Johnson in the Uxbridge and Ruislip constituency in next year’s General Election. Howling brought the house down when said he was ready to do a deal with Boris which would enable Boris to become MP for Uxbridge and Ruislip as long as Howling could take over as London Mayor!!! Morecambe wises up to Co-ALE-ition! Derrill has just got back from a 5 day tour of the NW and on his travels which included delivering cases of Monster Mash in a bottle to Loony Party members — Mark Beech in Walsall and Tony Davies in Blackpool together with 8 other people in the NW who had all ordered at least one case. One of Derrill’s last port of calls on this NW trip was Morecambe where he stayed with a former customer of Howling’s — Mike “Geordie” Carlin who had stayed several times at the Dog and Partridge in Yateley when Howling was mine host. Geordie Mike said that Howling’s ” Full English ” was legendary but unfortunately had nothing to do with breakfast. 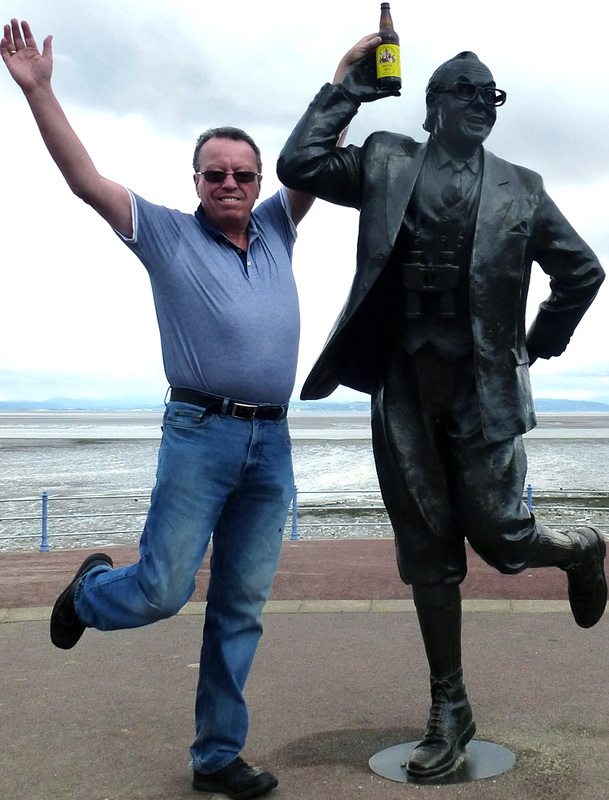 Derrill was also introduced to Morecambe’s most famous local resident and one of the outstanding comedians of our lifetime on Morecambe Promenade overlooking Morecambe Bay with outstounding views of the Lake District in the background. Derrill took the opportunity to introduce Eric to Co-ALE-ition i.e. Monster Mash in a bottle and would no doubt have asked Eric “what do you think of it so far?”. Eric would perhaps have responded with his famous “Wahey” and then would probably have broken into song with a line or two of “Bring Me Sunshine” reflecting that Monster Mash was the perfect golden ale on a glorious late summer’s afternoon. Hard to believe it is 30 years ago (May 1984) since Eric Morecambe died especially as this was only a year after the first ever OMRLP candidates stood at a General Election. Virtually a year has now passed since we first launched a Co-ALE-ition real ale brewed by a local Hampshire brewery especially for the OMRLP. Since then a total of over 25,000 pints of Co-ALE-ition have been consumed in more than 140 different establishments across 9 different counties and also in Central London. In addition a Co-ALE-ition main story has featured in more than 60 different newspaper and magazine articles all of which has helped to publicise and promote the OMRLP and confirm to potential votes that there is plenty of life in the old dog yet. A total of 18 different Co-ALE-ition events were organised over the last 12 months and have been well attended. 14 members of the OMRLP have attended at least one Co-ALE-ition event. A particular highlight was the launch of Monster Mash at the Mash brewery followed afterwards by visits to two Winchester pubs attended by Howling and all 5 Cabinet members who were featured on the Monster Mash pumpclip. Who could also forget the trip to the Houses of Parliament and Howling and Knigel drinking Winning Co-ALE-ition in The Strangers Bar with 4 MPs. Also the Winning Co-ALE-ition launch event at the Prince Arthur in Fleet last Sept, attended by over 300 guests including MPs, Mayors and many local councillors, was another memorable occasion. Howling’s appearance on the BBC’s Politics Show also publicised Co-ALE-ition to the masses. 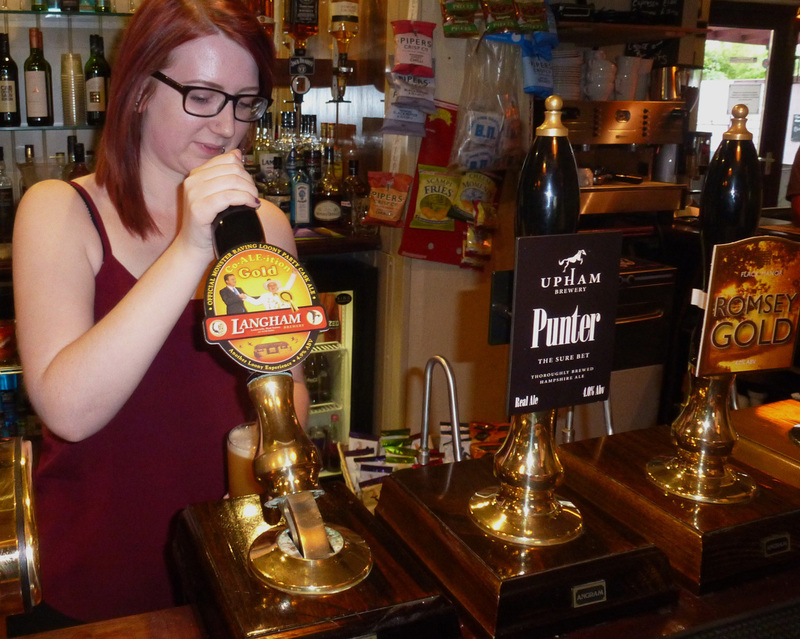 Both the Fleet Lions Ale Festival and the Nags Head in Reading featured all 6 Co-ALE-ition ales on one day. The Prince Arthur (Fleet) and the Waggon and Horses (Hartley Wintney) have both sold 5 different Co-ALE-ition ales over the last year. Mash brewery produced a bottled conditioned version of Monster Mash real ale which has proved to be very popular. All 1000 bottles of this special edition were completely sold out in just 6 weeks since we officially launched it in late July and we now have a waiting/reserve list. We have since heard of bottles of Monster Mash making their way to St Louis (USA), Annecy (France) and Sydney (Australia). The 1st year Co-ALE-ition Party is on Thursday 18th Sept with a special lunch of home made Steak and Ale Hot Pot made with Monster Mash ale. This lunch will be followed by the main event starting at 6pm hosted and arranged by Howling in the Prince Arthur in Fleet where 4 different Co-ALE-ition ales will be on sale. Then finally from 9.30 we finish the night at the Hook Tandoori where we will officially launch Monster Mash in a bottle with a curry at the best Indian restaurant in Hampshire. No doubt Howling will have some surprises for us especially as the Scottish Independence count takes place on the very same night, lets hope he is not wearing a kilt that night!!. Our Co-ALE-ition 1st Year Anniversary Party will take place on Thursday 18th Sept. This date was chosen as it is exactly a year to the day when our very first Co-ALE-ition ale ” Longdog brewery’s Winning Co-ALE-ition ” was officially launched in front of a gathered audience of over 300 people at the Prince Arthur in Fleet. In addition on the night of the 18th Sept the Scottish Independece from the UK vote takes place and no doubt Alan Hope and the Loony Party will have something very special in mind to mark this potentially historic occasion. 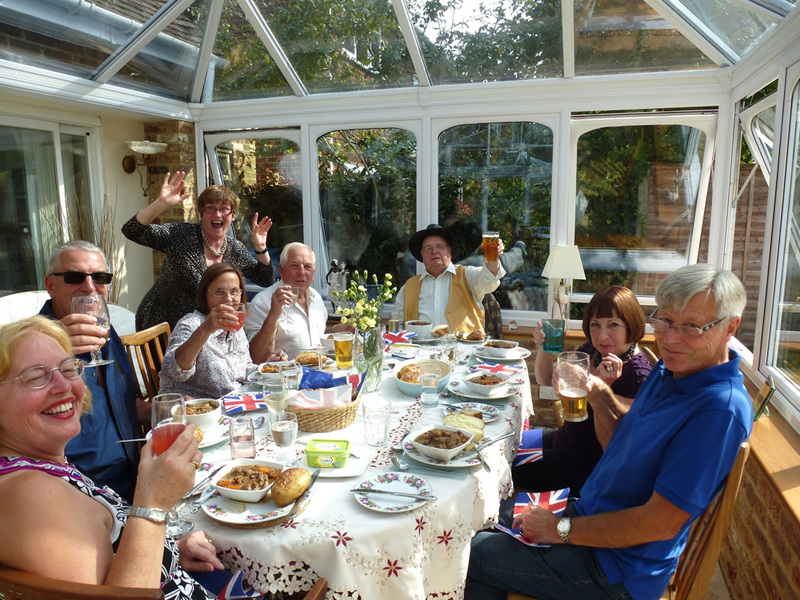 The day (18th Sept) will begin with a special home made lunch in Fleet at 1pm where invited guests will be served with Steak and Ale Hot Pot made with Monster Mash ale followed by Cheriton Orchard Apple Crumble and Custard and of course a glass of Monster Mash ale poured from a bottle. Very limited availability left now for this special lunch so contact me if you would like to attend. From 9.30pm there will be an Indian Meal and further celebrations at the Hook Tandoori, transport by car is available from Fleet to Hook and Hook Station is just two minutes walk away from the restaurant. Monster Mash in a bottle will be available to drink with your curry.Very limited availability left now for this special Indian meal so contact me asap if you would like to attend. After the Indian restaurant some of us plan to return to the Prince Arthur in time for last orders. 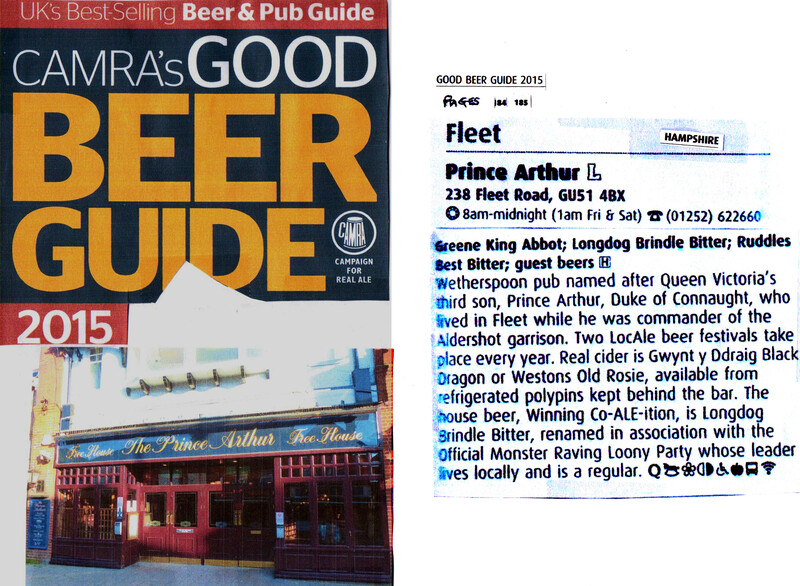 The Prince Arthur in Fleet features in CAMRA’s ‘Good Beer Guide’ which names Winning Co-ALE-ition as the house beer, and our Loony connection. The CAMRA GBG sells over 500 thousand copies each year, goes all round the world and is read by millions, even libraries stock it. 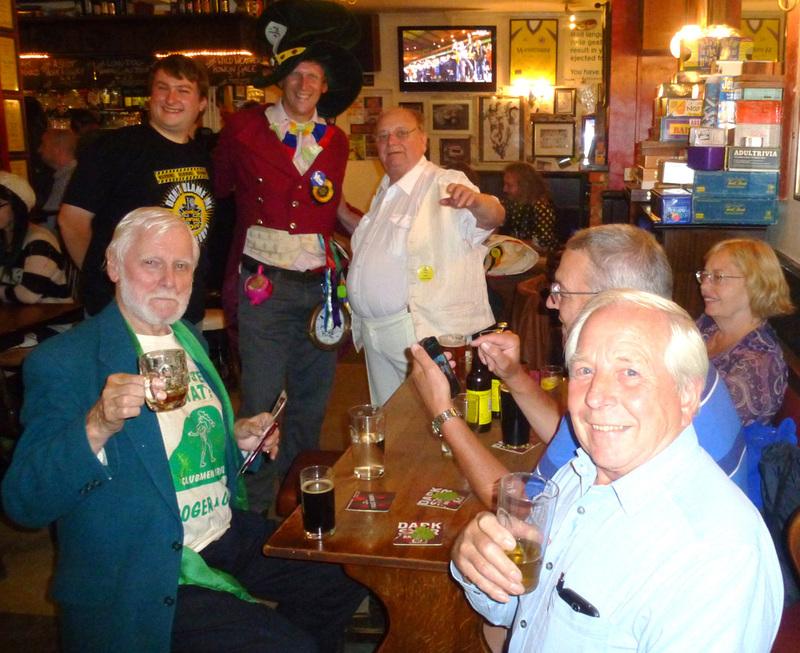 The latest Co-ALE-ition celebration event took place at the Nags Head pub in Reading (Berkshire) on Wed 27th August. Jody Oates, Landlord of the Nags Head, had promised to put on all 6 of Co-ALE-ition ales in the build up to our 1st anniversary on 18th Sept. The Nags Head is the current CAMRA Pub of the Year for the Reading and Mid Berks area and also got into the Top 15 real ale pubs across the whole of the UK in 2013. There was a very good turn out and the pub was completely full. We had 26 people in our group which included 8 local CAMRA members. 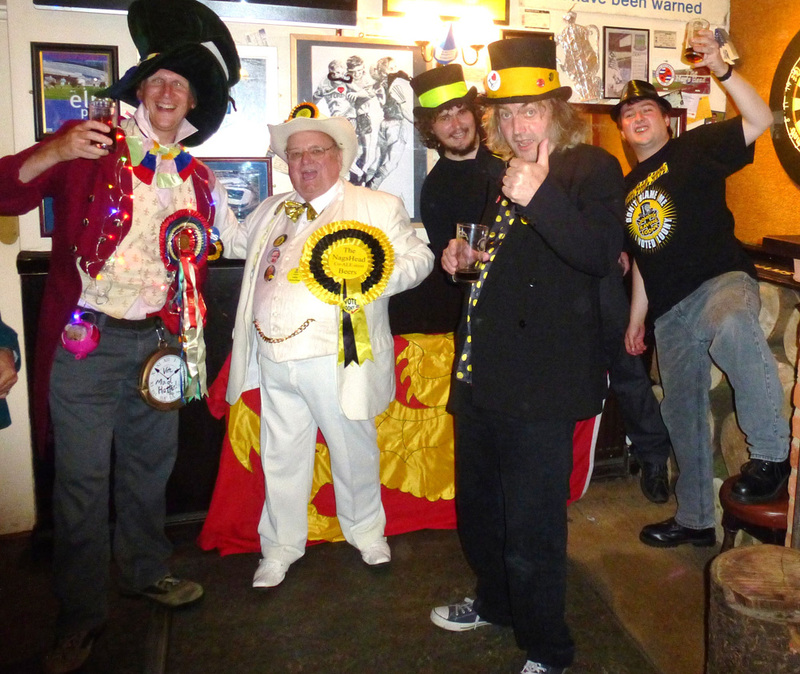 Loony Party attendance included Tony Davies from Blackpool, Mark Beech from Walsall, The Mad Hatter from Oxford and Knigel “Big Fibber” Knapp from Stoke Newington. Colin Bex , the esteemed Leader of the Wessex Regionalist Party, also graced us with his presence. Two Co-ALE-ition breweries were represented i.e. Wild Weather (Mike Tempest) and Mash (Graham Turner). Howling presented Jody Oates, Landlord of the Nags Head, with a signed and framed certificate for becoming the 1st pub to sell all 6 Co-ALE-ition ales at the same time (see Co-ALE-ition Hall of Fame section for further details). The CAMRA Reading & Mid Berks branch presented the Nags Head with the Pub of the Year certificate (6th consecutive year the Nags Head has won this award). Howling personally signed five bottles of Monster Mash and two of them were given to Jody Oates and Phil Gill (Editor of Reading and Mid Berks quarterly magazine which is called CAMRA’s Mine’s a Pint). A two page article on Co-ALE-ition will feature in Mine’s A Pint in their special Xmas edition. The other three bottles of Monster Mash were sold on the night. Tony Davies (Blackpool Loony) was the star of the night, he had a pint of all 6 Co-ALE-ition ales and was still able to beat Mark Beech (The Good Knight Sir NosDa) at darts. 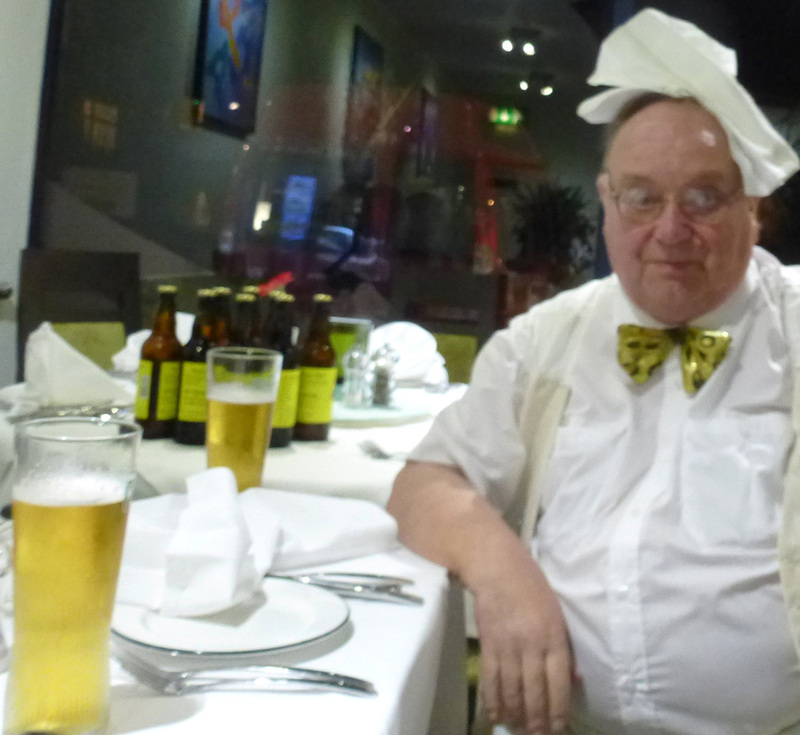 Some of our group had an Indian meal at the House of Flavours before they arrived at the Nags Head. Lola (Jody’s partner) and her mother Sylvia put on food, sausage and onions in a baguette, which proved to be very popular. The 6 Co-ALE-ition ales sold very well, they were all next to each other on the bar. There were a total of 12 different real ales available on the night. 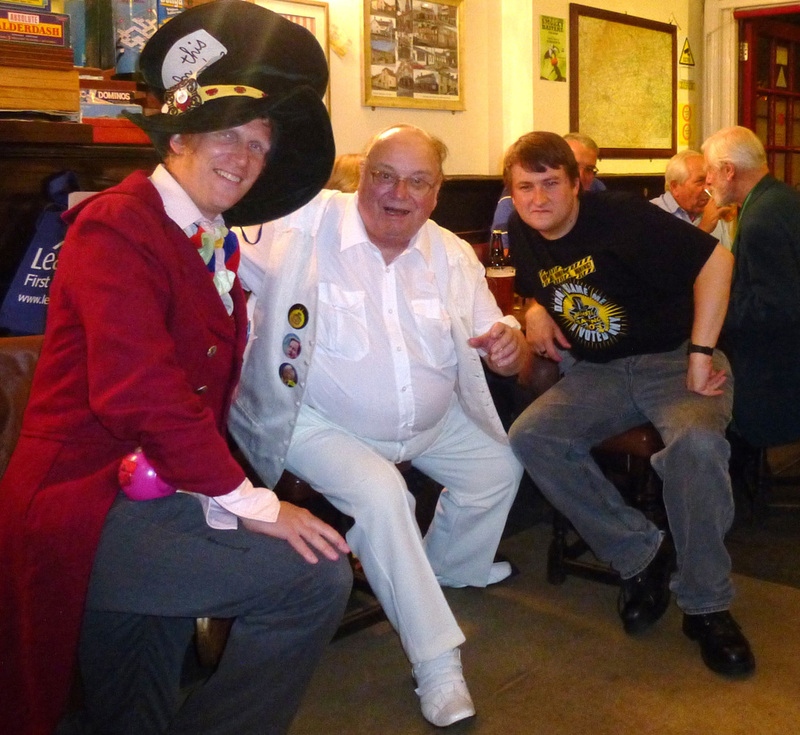 Howling was on great form and the Mad Hatter, dressed in his full regalia, attracted lots of interest from the locals. Howling steps up to the mark!! 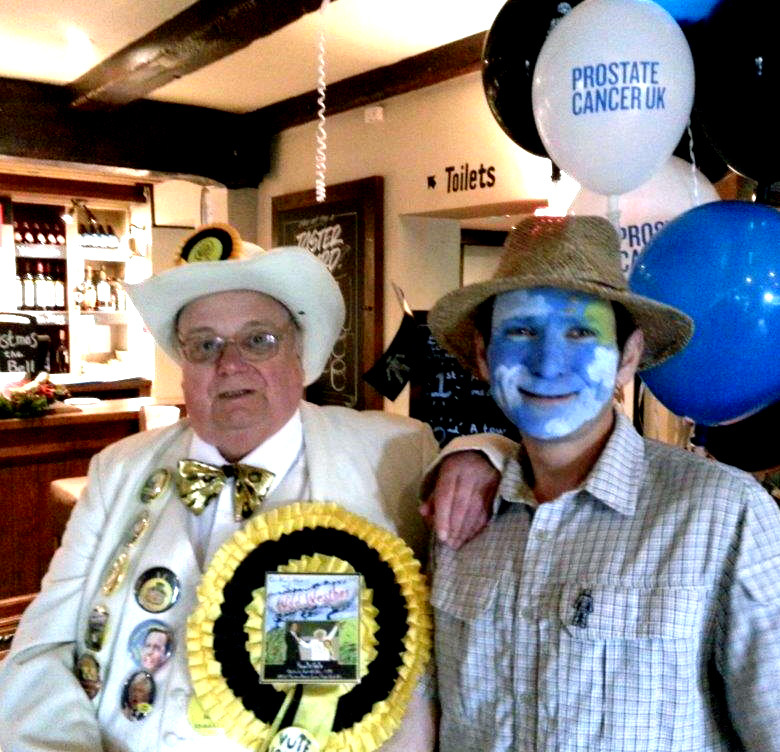 Howling was the special VIP guest at the Old Bell at Grazeley Green (Berkshire) on Saturday where he opened the pub’s annual charity event for Prostrate Cancer which was held over the recent August bank holiday weekend. Wild Weather brewery were the featured guest ales including the Co-ALE-ition branded HowlinGale. Mike Tempest (Wild Weather brewery owner and head brewer) was in attendance as were loyal Loony Party supporters Steve and Joy Lawson. A good time was had by all, Howling and his group were well looked after by Louise (Managerof the Old Bell) and Mike (Deputy Manager of the Old Bell). Howling threw himself into all of the activities and was even caught on camera stealing a few yards in his final act of desperation to become a winner. 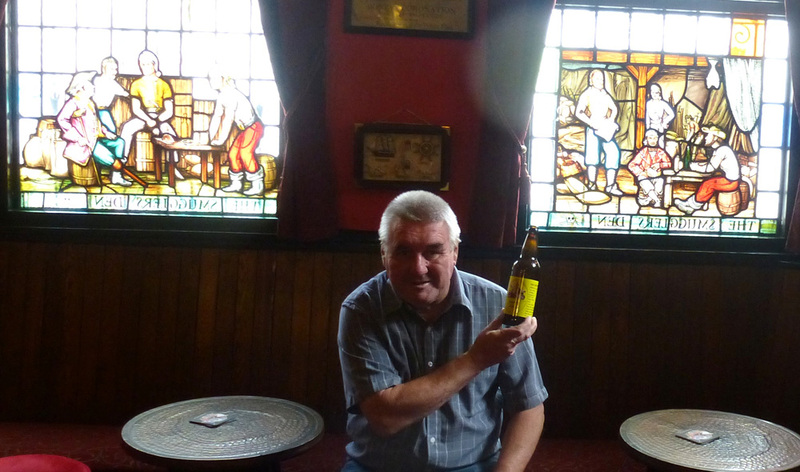 It has taken more than 8 months from the official launch at Langham brewery in early Dec 2013 for Co-ALE-ition Gold to appear in a free house in Howling’s local area. We have got close many times but each time we haves got our hops up we discovered that Co-ALE-ition Gold had been rebranded and sold as as Arapaho with a completely different pumpclip even in the many situations where Derrill and Alan had agreed the saloe and supplied the pub lead and contact details to Langham brewery. The most recent example was at the Waggon and Horses pub in Hartley Wintney earlier this month which deprived the landlord (Niall) from becoming the 1st pub to have all 6 Co-ALE-ition ales on sale in a period of less than a year and consequently missing out on his Howling personally signed and framed OMRLP certificate. It has been a very frustrating period working with Langham’s brewery but we cracked it at last with Co-ALE-ition Gold appearing at the Rose and Crown in Sandhurst last week. This current CAMRA Berkshire Pub of the Year, which also hosted the official launch of Monsters In the Dark last month, is fully committed to taking all 6 Co-ALE-ition ales this year. Here are a couple of photos which Derrill took at the Rose and Crown in Sandhurst of this momentous occasion, which will probably never be repeated again in our lifetimes. Derrill marked this pint of Co-ALE-ition Gold, 5 out of 5 on CAMRA’s whatpub website, it really was superb. Derrill went back again with a group of friends and drank some more pints of Co-ALE-ition Gold the very next day but alas it was gone after that session.